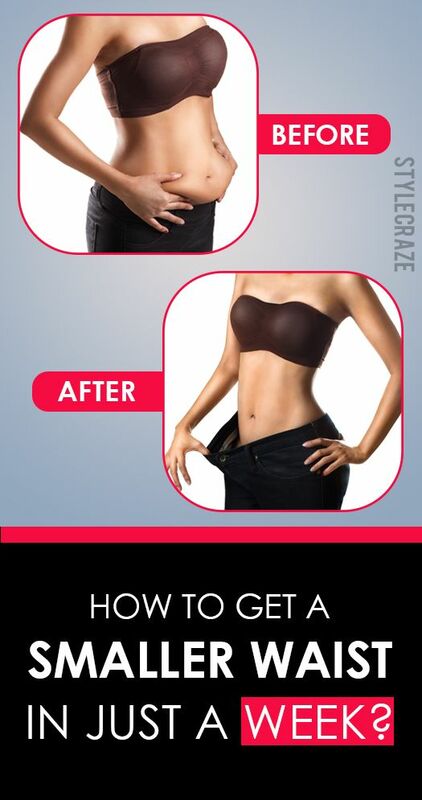 Do you want to achieve that hourglass figure just like your favorite actress? Has a slim waist been your dream, and do you often feel it is something impossible to achieve? 1. Alter Your Diet: Scientific studies conclude that eating whole grains, along with fruits and other vegetables helps you reduce the amount of fat you consume. Consuming whole grains is healthier as they contain no preservatives. This is one of the best ways to get slimmer within a week. Remember that fruits sometimes contain high amounts of sugar and eating too many fruits can be counterproductive. Doctors say you need to reduce 3,500 calories from your diet to lose one pound. The threshold for healthy weight loss is 2 pounds a week, so don’t starve yourself with fad diets. Eat healthier, not lesser. 2. Drink More Water: Another important thing to do when trying to lose weight is drinking more water. This helps prevent your body from getting confused between thirst and hunger. To limit the tendency to binge on food, drink more water. It is good for the skin and hair as well. 3. Focus On Quality, And Not On Quantity: Usually, people who diet tend to not eat anything, as opposed to eating healthy foods that don’t add excess fat or sugar to your body. The secret to dieting is eating more healthy meals, which do not add excess calories to your body. 4. Exercise: Wondering how to make waist smaller in a week? Exercise is the perfect solution! Yes, the most obvious thing to do for getting slimmer is exercise. Thus, you getting a trimmer waist will depend on how hard you are willing to work. Results will only follow when you put in the effort and dedicate yourself to the causes. However, take care and ensure that you begin gradually. Don’t psyche yourself up for the first day and overexert yourself or get injured. Increase the exercise intensity gradually. Make an exercise plan, where you begin at a basic level working through all stages and performing more intense and longer exercise routines. Maintain an exercise journal or leave an update on Twitter to remind yourself of what is to be done. Often, when you announce something in public, you are more obliged to do it. With time, you will begin to enjoy regular exercise without feeling worn out or disinterested. 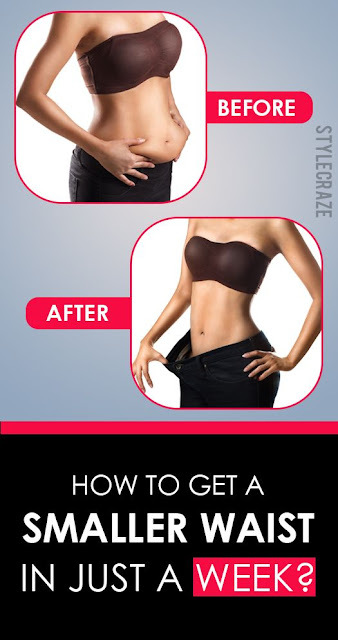 Along with trimming your waist, this will also ensure that you live a healthier life. You can also perform target-specific exercises, especially the ones that help shape the waist. These exercises are quite important; even though you cannot directly target weight loss on the waist, you certainly perform certain exercises that tone and slim your mid-section muscles. Wow what an insightful page. I'm over the moon glad that I found you. I'll surely try your methods to lose weight. Thanks so much!!! !